Disturbed sleep is common in people who have bipolar disorder. Many experience vivid dreams and nightmares, coupled with either insomnia or too much sleep, depending on whether they're in a manic or depressive episode. Here is some more information on vivid dreams, like nightmares and even night terrors, in bipolar disorder. In people without sleeping problems, there is more deep sleep at first. Then as time passes, periods of REM sleep become longer. This general pattern, however, can be distorted or disrupted by any one of a number of sleep disorders or disturbances, many of which have been shown to be associated with bipolar disorder. One example of a sleep disturbance is a parasomnia called nightmares. Nightmares occur during rapid eye movement (REM) sleep, and they cause a person to wake up abruptly from sleep. Some experts believe that nightmares in people with bipolar disorder may provide clues to their current mood. For example, according to an article in Mental Health Reviews, the authors suggest that dreams about death and injury may signal a person's shift to a manic episode. On the other hand, in a depressed episode, a person's dreams may consist of anxiety-related themes. In addition to vivid dreams and nightmares, the pattern of sleep can provide clues to a person's mood. In a depressive episode, significant insomnia coupled with vivid dreams is common, as opposed to a decreased need for sleep during a manic episode. During a depressive episode, a person often has an extremely difficult time falling back asleep. If they do fall asleep, they only get shut-eye for short periods of time, like 15 minutes to an hour, and the sleep is often unpleasant, restless, and filled with life-like dreams. This restless sleep can lead to anxiety and frustration, as a person desires to sleep so badly. It can also cause problems in functioning throughout the next day, including cognitive problems, like memory impairment. 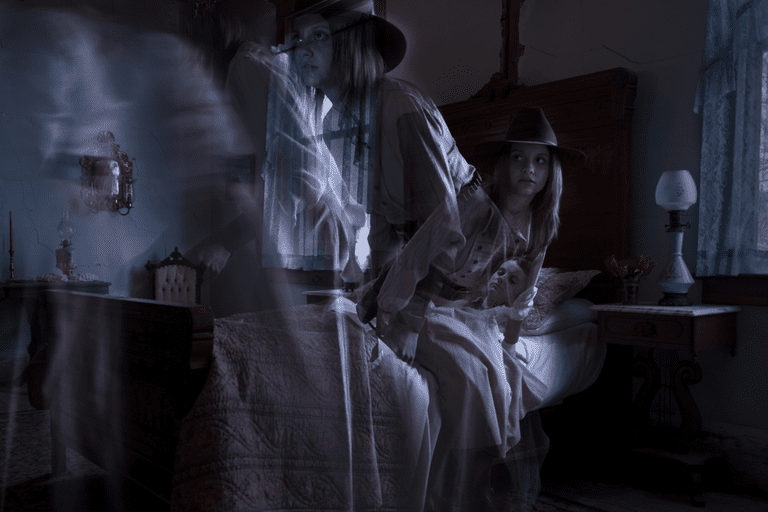 Night terrors are also an example of a parasomnia. Night terrors do not occur during REM sleep and are not dreams, although they have nightmarish elements. They occur instead either during deep sleep or in a transitional state between deep and dreaming sleep. Like nightmares, a person having a night terror will wake up abruptly. But unlike nightmares, they are confused and often do not talk or appear to be fully awake to their loved ones. Night terrors are rare in adults, yet bipolar disorders and depression with anxiety are factors associated with adults who report night terrors. Examples of night terrors reported in adults with bipolar disorder include walls closing in on them or insects or reptiles crawling over their bedroom. In these episodes, people are known to appear to awaken, recognize no one, and exhibit symptoms of extreme fear, even screaming, thrashing around, or running from the bedroom. Children too with bipolar disorder suffer from sleep disturbances. According to a 2012 study in Front Psychiatry, approximately 70 percent of children reported insomnia during a depressive episode and 50 percent reported a decreased need for sleep during a manic or hypomanic episode. Of course, like adults, sleep symptoms may also occur during periods of remission too. Also, children who suffer from bipolar disorder suffer disproportionately from nightmares. In fact, dreams of explicit violence, gore, and death are a common symptom as are dreams that signal a fear of abandonment. Of course, most children experience nightmares on occasion. But children with bipolar disorder can experience prolonged nightmares that last hours. Good sleep is important for both mental and physical health and research suggests that poor sleep can contribute to relapses in bipolar disorder. Therefore, if you're troubled by vivid dreams, be sure to talk to your doctor about it. Some medications may be able to suppress your dreams so you can get a more peaceful night sleep. Ameen, S., Ranjan, S. & Nizamie, S.H. (2002). The Reinterpretation of Dreams. Mental Health Reviews. Baroni A, Hernandez M, Grant MC, Faedda G. Sleep Disturbances in Pediatric Bipolar Disorder: A Comparison Between Bipolar I and Bipolar NOS Front Psychiatry. 2012;3:22. Harvey AG, Talbot LS, Gershon A. Sleep Disturbance in Bipolar Disorder Across the Lifespan. Clin Psychol (New York). 2009 Jun;16(2):256-77.